So here I am, actually writing my post in the FeedBurner office. I figured that while I was here, I would learn about IE7 and Feedburner. But first, let’s not forget what’s really important: The FeedBurner offices. Every bit as cool as the company. All the walls are different colors, and the tables are set up like industrial picnic fences. You can feel the energy in the air. Anyway, John Z, my always-responsive correspondent, explained the issues to me. The new IE 7 has the ability to subscribe to feeds (just click on the feed button.) But since it’s not a “standard FeedBurner thing,” I couldn’t understand why I was getting FeedBurner statistics showing me that I had IE7 subscribers. The issue, John said, is about autodiscovery. Many blogs and podcasts have set feed preferences in their source code. That way, when someone goes to subscribe to a feed with IE7, if they have their autodiscovery set up as FeedBurner, they can track the subscription through FB. Blogger users like me are out of luck – Blogger doesn’t support autodiscovery. So why do I still see IE7 subscribers? When someone clicks on a generic feed link on my blogsite, and they are using IE7 as their browser, IE7 knows that I have a feed (and knows that I have FeedBurner, since that’s the spot that the orange feed link usually goes to), formats it like a feed and serves up the opportunity to subscribe. Like this – see the Feedburner address in the address bar (with their flaming icon)? 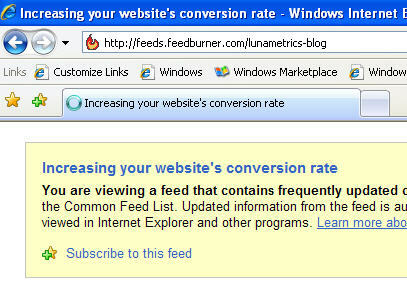 Summary: If someone uses IE7 to subscribe to a feed with FeedBurner autodiscovery enabled, FeedBurner always measures it. If someone uses IE7 to subscribe to a feed like mine (no autodiscovery) they have to use the icons on my site, not merely the IE7 icons, for FeedBurner to notice it. ps John Z gets all the credit for this post. I am just the journalist here and get credit for all the mistakes.